Effortlessly “train” your brain to access and awaken your deepest levels of creativity, spiritual awareness, and problem-solving capabilities — whenever and wherever you need them! A revolutionary audio process AUTOMATICALLY guides your brainwave activity into the AWAKENED MIND PATTERN observed in all breakthrough thinkers, great artists, and business visionaries. To experience life the way they do, all YOU have to do is listen! With so much going on in life, it's easy for our minds to get stuck in a rut. A kind of "same old, same old" thinking pattern that chains us to the past, inhibits our creativity, and keeps us from having a full, vibrant, joyous experience of life. Imagine, instead, that you get out of bed, and, rather than feeling daunted or depressed by the day ahead, you feel energized and excited — as if you were on the first day of a vacation, heading out to explore a brand-new landscape. As you move through your day, projects at work and issues at home that you'd been "stuck on" would no longer stymie you. The precise solutions you needed would simply present themselves to your awareness, as if pulled from some vault of wisdom you never had access to before. In this state of mind, the fears, annoyances, and limitations that crowd your thoughts now would evaporate: You would automatically see beyond them. Incredibly, it is possible to live like this. And not just for one day. You can have that experience every day of your life. The best part is, not only is it possible — it is amazingly easy. In fact, to experience the extraordinary state of mind I've just described, you don't have to do anything more than push a button, sit back, and relax. The sort of heightened consciousness I've described above — calm, yet energized, alert, unencumbered, in touch with a deeper level of knowing — reflects a brainwave frequency that famed British researcher C. Maxwell Cade termed the "Awakened Mind Pattern." Cade first observed this pattern while investigating the brain frequency behavior of what he deemed extraordinary people: masters of meditation and yoga, great artists and inventors, individuals who seemed to think, work, create, and live on a higher level ... who weren't held back by the limitations that "ordinary" men and women so often perceived. He was fascinated to discover that, in spite of vast differences in personality and behavior, all of these individuals displayed a remarkably similar brainwave pattern — a specific and unique combination of the Beta, Alpha, Theta, and Delta waves. His research ultimately convinced him that this unique pattern held the key to awakening and developing one's highest potential. Cade's findings had implications in many areas of science and research. But they were particularly fascinating to Dr. Jeffrey Thompson. A world-renowned pioneer in the emerging science of sound healing (and the creator of the bestselling program The Brain Massage), Dr. Thompson has spent more than 25 years investigating the impact of sound on human physiology, thinking, and behavior — and developing cutting-edge therapeutic sound technologies to address specific needs and interests. Connecting Cade's discoveries with what his own groundbreaking research had proven about the ability of sound to influence brainwave frequencies, Dr. Thompson created a unique audio technology that could automatically orchestrate the Awakened Mind Pattern in the mind of anyone who simply listened to it — enabling that person to experience the same high levels of consciousness, awareness, and clarity exhibited by great spiritual and creative masters. This remarkable new program is called The Awakened Mind State Audio Experience. And I'd like you to experience it risk- free! Yes, I want to awaken the deepest levels of my consciousness, renew and refresh my mind, and enliven my whole being ... EFFORTLESSLY, with just the touch of a button! Please send me The Awakened Mind State Audio Experience AND bonus CD. What makes The Awakened Mind State Audio Experience different? There are lots of "sound therapy" programs on the market, and they all make big promises about the kind of mind states they can induce. But precious few of these have achieved the kind of international high-level respect and professional stature that the programs created by Dr. Thompson enjoy. Fortune 500 companies; leading universities; healthcare, meditation, and bodywork professionals; spiritual leaders such as Dr. Deepak Chopra and Louise Hay; and individuals worldwide use his programs for life enhancement and personal transformations of all kinds. The key to the amazing, brain-reviving power of The Awakened Mind State Audio Experience lies in the extraordinary process Dr. Thompson used to create the recordings. In the same way that a conductor guides all the players in an orchestra to create a harmonious symphony, Dr. Thompson "conducts" an astounding array of different sound tracks — as many as 30 different tracks at a time! — into a single powerful soundscape minutely engineered to guide your brainwaves into the Awakened Mind Pattern. What you actually hear when you listen to The Awakened Mind State Audio Experience is a beautiful musical soundtrack, recorded with state-of-the-art 3D technology, so it's as if you are completely surrounded by music. But embedded within that soundtrack are sounds of nature, man-made sounds, vibrations, and more. These sounds are painstakingly combined to stimulate the precise brainwave pattern that will bring you into a state of heightened consciousness (i.e., the " Awakened Mind State"). Yet they are processed in such a way that you experience the physical and psychological effects of these sounds in combination, even though the sounds themselves are inaudible! The lush, ambient musical soundtrack of The Awakened Mind State Audio Experience is designed to open the gateways to the deepest and most fertile realm of your consciousness, and carry you to a higher, more lucid level of thinking, acting, and living. Experience a fully awakened mind for the first time ever. The Awakened Mind State Audio Experience is really something that has to be experienced in order to be fully understood. And I'd like to make it as easy as possible for you to experience the wonder, power, and freedom of a fully awakened mind for yourself. Click on the link below now to order The Awakened Mind State Audio Experience. As soon as your order is received, we'll send you the complete program — all six CDs: Inner Awakening, Dynamic Transformation, Expression, Inspiration, Renewal, and Insight, along with the extraordinary FREE BONUS CD I describe below — to listen to and benefit from. From the very first time you put on your headphones and listen to these CDs, you will notice a dramatic difference in your thinking, your feelings ... the entire way you view the world. It really feels like a crisp, fresh breeze blowing through your mind, clearing out the tiredness, listlessness, and old ways of thinking, and leaving you clear, energized, and in touch with your deep wellspring of knowledge and wisdom — the part of the mind that only the world's most creative, enlightened individuals ever access. Experience that extraordinary feeling for yourself, with no risk and no obligation. 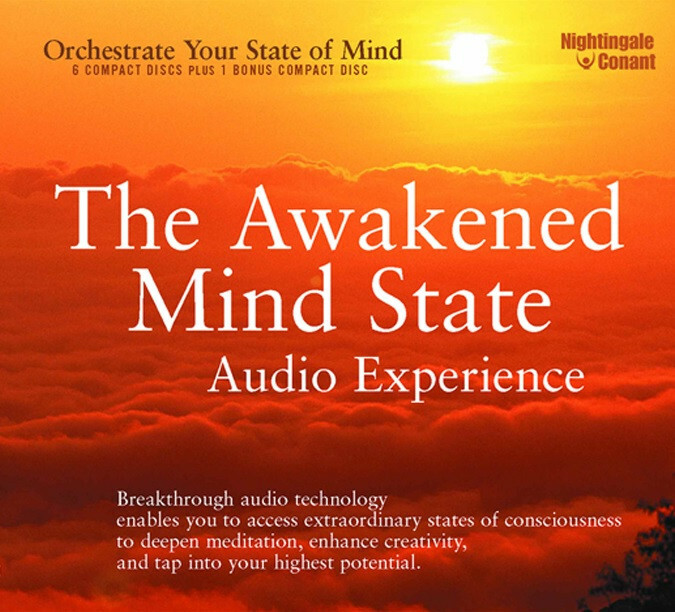 Order The Awakened Mind State Audio Experience today! P.S. The profound effect of The Awakened Mind State Audio Experience is the result of a ne ur oscientific process that bypasses the conscious mind and connects directly with your brainwave frequencies. In other words, you don't need to "believe" that it can work in order for it to work. Even the most hardened skeptics experience an amazing mental awakening as a result of listening to these CDs. There's no risk and no obligation if you decide The Awakened Mind State Audio Experience is not for you. So why not give it a try? P.P.S. The Awakened Mind State Audio Experience comes with a FREE BONUS that you absolutely must not miss. It's called NASA Voyage Soundscapes, and it features audible interpretations of the electromagnetic vibrations that emanate from planets, rings, and moons: the true "music of the spheres"! I've never heard anything like it. This CD is positively magical — as close as you can get to an actual journey to the stars. It's worth ordering the program just so that you can hear it! YES, I want to awaken the deepest levels of my consciousness, renew and refresh my mind, and enliven my whole being... EFFORTLESSLY, with just the touch of a button! Please send me The Awakened Mind State Audio Experience AND bonus CD for just $69.95, which is 70% OFF the regular program price of $234.95! Take advantage of this limited-time special discount now! If within 30 days I am not satisfied with the program, I will simply send it back for a full refund. No questions asked. AMAZING FREE BONUS when you order The Awakened Mind State Audio Experience. For many people, the ethereal images of outer space — glowing orbs set against the backdrop of blackness ... the sense of stillness and silence — have a naturally calming, meditative effect. Yet few people realize that there is sound in space. Each planet, moon, and ring system has a distinctive "musical" pattern embedded in an electro magnetic vibration that is created through interactions between their magnetosphere and the solar wind. These vibrational patterns were recorded during the journeys of NASA Voyager 1 and 2, using highly sensitive equipment connected to the exterior of the crafts. Under ordinary circumstances, they are inaudible to the human ear. Yet the vibrations seemed to have a profound effect on the astronauts who were exposed to them. Intrigued, NASA representatives approached Dr. Jeffrey Thompson with the recordings, in the hope that he might be able to discover more about them and their possible benefits. In response, Dr. Thompson developed an extraordinary method of "decoding" these vibrations, which enabled them to be heard through speakers, allowing people to audibly experience — for the first time ever — the world beyond planet Earth. The result is NASA Voyage Soundscapes, a unique and one of the most remarkable and deeply affecting audio experiences you will ever have. Incredibly beautiful and deeply mysterious, this CD will quite literally transport you to another world. NASA Voyage Soundscapes will touch primordial, mystical cords in the heart of your subconscious and awaken within you a profound sense of connection to the universe. Fascinating to hear and wonderful for relaxation, stress reduction, creativity enhancement, and meditation, it is yours to listen to and enjoy along with The Awakened Mind State Audio Experience — ABSOLUTELY FREE! Don't miss this opportunity to experience one of the most unusual audio journeys you will ever take.